By all standards of success, James Templeton seemed to have it all. He was a highly successful businessman, had a beautiful wife and daughter, and, only in his early thirties, had his whole life in front of him. To avoid the same fate as his father and grandfather, who both died of heart attacks at a young age, James became an avid runner—a passion that he believed helped him stay fit and healthy. Imagine his shock when, during a routine physical, his doctor noticed a mole on his body that turned out to be a melanoma—a dangerous form of skin cancer. The mole was removed immediately and James, who was diligent in his follow-up exams, appeared to be cancer-free—but only for a short while. When the cancer reappeared and had spread, on the advice of his doctor, James followed the conventional medical protocol, which included surgery and chemotherapy. He was also involved in a clinical trial. When he learned that the treatments weren’t working, James was obviously devastated. He had reached a new low point in his life, and as he lay in the hospital bed, he prayed fervently for help. As if by some miracle, help came to James in the form of three different visitors who would change the course of his life—and help direct him on a path back to health. A fifth generation Texan, James Templeton tapped into his fighting spirit and became an over 30-year cancer survivor who healed himself from a terminal diagnosis with the use of alternative medicine and healing modalities. As the visionary founder of Uni Key Health Systems and Templeton Wellness Foundation, James has since utilized his wisdom and experience to helping others achieve optimum health and wellness. He is also the co-author of Your Body Knows Best. Now a resident of the Pacific Northwest, James dedicates much of his time to living a healthy lifestyle and inspiring others to do the same. He also enjoys outdoor activities and spending time with family. "My friend James is a perfect example of the life changing power of truly healing foods. I highly recommend you read his inspiring story and learn how you too can tap into the restorative properties of the right foods and supplements." "James Templeton, whom I know personally, is a determined and courageous man who overcame Stage 4 Melanoma Cancer more than 30 years ago using predominantly natural means. 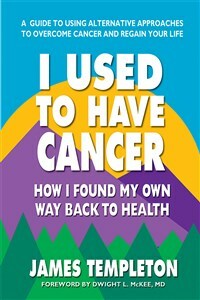 His story and other cancer survivor stories on his website will give hope to those with cancer who have been told by conventional doctors that there is no hope. I urge the readers of his website who have cancer to follow the examples of these cancer survivors and to become not only a survivor, but a thriver like James."